Chris was appointed Principal Trombone of the Orchestra of Opera North, Britain's newest and most innovative opera company, when he was 21. Since then he has appeared as Guest Principal with most major UK ensembles including the London Symphony, London Philharmonic, Philharmonia, Royal Philharmonic, Royal Opera House Covent Garden, London Brass, London Symphony Brass and the Symphonic Brass of London. A graduate of London's Guildhall School of Music, Chris studied with Denis Wick, Eric Crees and Peter Gane, and was awarded the Principal's Prize. Prior to this he was a member of the European Union Youth Orchestra and Great Britain's National Youth Jazz Orchestra and National Youth Brass Band, gaining the LRAM Diploma while still at school. 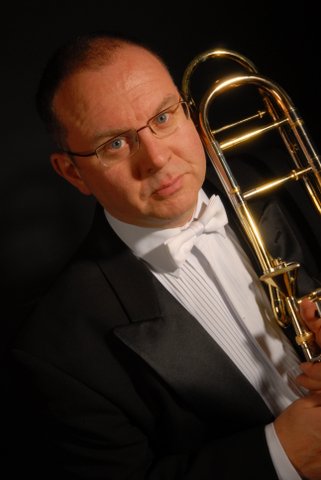 Recently appointed Professor of Trombone and Brass Ensemble at the Folkwang Hochschule Essen, Germany, he is also Senior Tutor in Brass at Manchester's Royal Northern College of Music and regular Trombone Professor with the National Youth Orchestra of Great Britain. He has coached the European Union Youth Orchestra and Gustav Mahler Jungend Orchester and gives recitals and masterclasses throughout the world, including the Joseph Alessi Summer Seminar, Juilliard, Eastman and conservatoires in Boston, Texas, St Petersburg, Porto, Oslo and Aarhus. In the UK, Chris has given recitals, classes and has served as outside assessor at London's Guildhall School of Music, Royal College of Music, Trinity College of Music and conservatoires and universities in Glasgow, Birmingham, Huddersfield and Salford. In 2003 Chris represented the UK in the World Orchestra for Peace under Valery Gergiev and has made concerto appearances with the Orchestra of Opera North (Elgar Howarth Concerto under the composer, Grondahl Concerto under Martyn Brabbins), Durham Sinfonia (Bourgeois Concerto) and Slaithwaite Philharmonic Orchestra (Albrechtsberger Concerto as soloist/director). A former President of the British Trombone Society and clinician for the Edwards Instrument Company, he has appeared as guest artist at International Festivals in Washington DC (ETW 2008), Las Vegas (ITF 2007), Sweden (2007) and Birmingham (ITF 2006) and currently serves on International Trombone Association Executive Board. His debut solo CD entitled Houlding his own was issued in February 2008 on the SRC label. Chris was awarded an MMus in Conducting by the Royal Northern College of Music in 2005 and held the position of Music Director with the Slaithwaite Philharmonic Orchestra for six years. He has also conducted the Orchestra of Opera North, RNCM Symphony Orchestra, Wind Orchestra and Brass Band (2007/8 Festival of Brass), NYO Open Day Orchestra, Lancashire Youth Symphony, Oslo Music Academy Brass Ensemble, Prinsen Musikkorps Brass Band, Denmark and Grimethorpe Colliery Band. As an adjudicator, he has served on international juries including the Turkish Young Musician of the Year, Norwegian Brass Band Championships, Feis Ceoil Dublin and the Royal Overseas League Music Competition an is a regular contributor to Brass Herald and Brass Band World magazines.